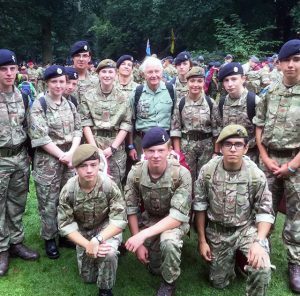 Four members from the Woking detachment of the Surrey Army Cadets joined Hampshire & Isle of Wight ACF on a pilgrimage to Arnhem this month to take part in an annual march of more than 40,000 armed-forces members to commemorate Operation Market Garden on its 70th anniversary. En route to Holland, the cadets visited the Menin Gate at Ypres in Belgium, a memorial to those who went missing in the battlefield area. They also visited a tank museum, took part in a battlefield study visiting key locations in the Arnhem area and laid a wreath at Oosterbeek War Cemetery in remembrance of those who did not return. Prior to the trip, Woking Cadets Da Silva, SAker, Martin and Rzayev each researched a local soldier from that time who had sadly lost their lives for their country and were buried in the cemetery at Arnhem. They located and lay a memorial cross at their graves. In September 1944, during the Second World War, Operation Market Garden was a daring allied airborne mission to capture a series of bridges crossing the River Rhine in Holland to allow allied forces to thrust into Germany to shorten the war and free Europe. Capturing and holding up the Arnhem Bridge for two days, deep behind enemy lines, was key to the success. Every September for the last 70 years, forces members and cadets come from all over the world to take part in the famous Arnhem Marches to commemorate the brave and determined efforts of the armed forces of all nationalities and the people of Arnhem.